Scitec 100% Whey Protein Professional van Scitec Nutrition is een eiwitpoeder om eiwitshakes mee te maken. 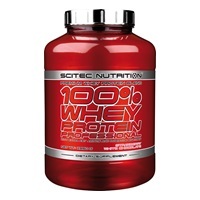 Scitec 100% Whey Protein Professional bevat whey concentraat en whey isolaat als eiwitbron. Whey is een goede eiwitbron met een hoge biologische waarde. “100% Whey Protein Professional is an excellent quality whey protein blend with whey concentrate and whey isolate. Dietary proteins are the source of nitrogen and indispensable amino acids, which the body requires for tissue growth and maintenance. Therefore 100% Whey Protein Professional contributes to the growth and maintenance of muscle mass, and also to the maintenance of normal bones*. Whey protein from milk is a so-called complete protein, because it provides the body with all the necessary types of amino acids, including the 9 amino acids the body cannot synthesize and must be supplied by the diet (i.e. Histidine, Isoleucine, Leucine, Lysine, Methionine, Phenylalanine, Threonine, Tryptophan, Valine). Afhankelijk van de smaak. Op scitecnutrition.com kun je de exacte inhoud van elke mogelijke smaak zien. Ingrediënten (smaak banaan): Whey Protein Concentrate (from Milk, Emulsifier: Soy Lecithin) containing lactoglobulin, lactoferrin, lactalbumin and immunoglobulin protein fractions; Taurine, Flavors (Banana, Cream), Dextrose, Sodium Chloride, L-Glutamine, Thickener (Xanthan gum), Sweeteners (Acesulfame K, Sucralose), L-Leucine, Whey Protein Isolate (from Milk, Emulsifier: Soy Lecithin), Bromelain extracted from Ananas comosus (1200 GDU/g), Papain extracted from Carica papaya (1.5 FIP U/mg). Allergenen-informatie: Bevat melk, lactose en soja (lecithine). Aanbevolen gebruik (volgens Scitec Nutrition): Mix 1 scoop met minstens 250 ml (0.25 liter) water of vruchtensap. Neem 1-3 shakes per dag als aanvulling op je voedingspatroon. 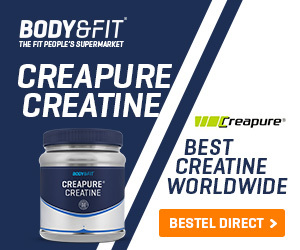 Scitec 100% Whey Protein Professional is online te bestellen. Voor een overzicht van alle webshops die dit product verkopen, zie het onderstaande overzicht. Dit product wordt verkocht in potten van 920 gram en 2350 gram. De grotere potten zijn per hoeveelheid goedkoper. Er zijn 21 verschillende smaken beschikbaar. De verschillende smaken zijn: banaan, cappuccino, caramel, chocolade-kokos, chocolade-hazelnoot, chocolade, chocolade-pindakaas, chocolate rocky road, honing-vanilla, aardbei & witte chocolade, aardbei, vanille, vanilla very berry, kiwi-banaan, lemon cheesecake, mandarijn-chocolade, granaatappel, vanille-peer, yogurt-perzik, kokos, chocolade-cookies&cream.